It’s a dangerous game making bold predictions ahead of high-stakes matches. Unless it’s a definite. 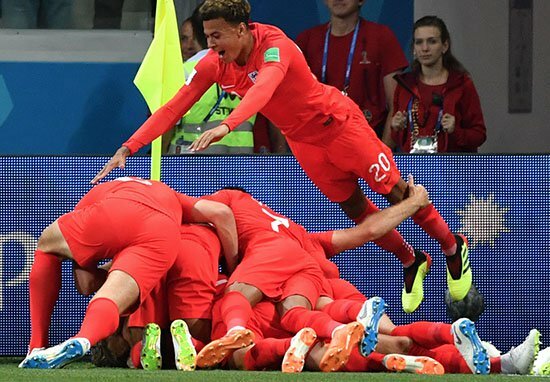 And it’s definitely coming home. The England team has confirmed it will play in their red away kit tonight against Colombia. That’s a definite. What’s also a definite is that England have won all 15 of their last games playing in the red uniform. I mean I’m no psychic octopus or mystic bear predicting the outcomes of World Cup fixtures, but a little bit of positive superstition can’t hurt can it? While white is fetching, and great in the current wave of hot weather we’re having, there’s just something about the red jerseys that seems to instil a certain optimism. Perhaps the red fires the players up, while also striking fear into the hearts of their opponents, who knows. But 15 unbeaten games while wearing the red ain’t bad is it. While we’re going off the red kit, a breakfast TV show in Russia has been predicting the outcome of every World Cup match using a bear. The bear picks up a football, and drops it into one of two barrels depicting the two teams who will be going head to head in the World Cup matches. Whoever the bear chooses will supposedly win the match. While the bear correctly ‘predicted’ England’s win over Tunisia, the stunt attracted plenty of criticism after BBC journalist Dan Walker shared a clip of the show, with the bear dressed in full footie kit. Fans were quick to show their anger at the footage, and at Walker for sharing it, slamming the footage as animal cruelty.